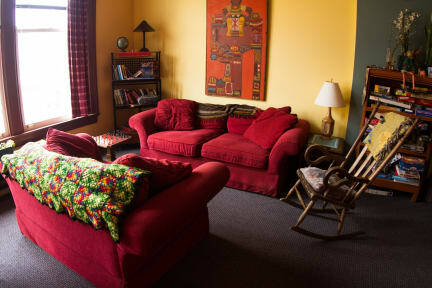 Hostel Buffalo-Niagara is a great cozy homestead for visiting Buffalo, NY and Niagara Falls. There is frequent local bus from Buffalo to The Falls, round trip fare $4. Take your passport along (and visa if required) so you'll be able to enjoy the Canadian side as well. Our modern, clean, safe and friendly hostel offers a perfect relaxing homestead. Along with our friendly Buffalonian staff full of local knowledge about shows and things going on in the community, the hostel has as spacious lounges, a fully equipped kitchen, a book exchange, a free store, bicycle loans, laundry facilities, free WiFi, Ping Pong and a little movie room in the basement with Netflix and one of the best collection of VHS Tapes :). 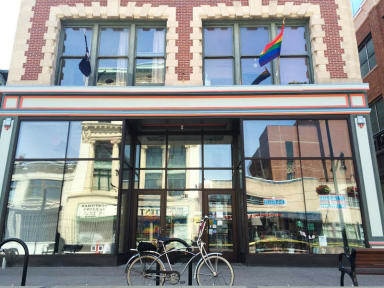 We are located in the heart of Buffalo's Theater District right next door to the Town Ballroom and Buffalo Visitor Center, across from Shea's Performing Arts, as well as down the street from the First Niagara Center and Buffalo-Niagara Conference Center. The hostel is a short walk from Historic Allentown and the Chippewa Strip where live music and nightlife is ample. A 10 minute walk from the infamous Anchor Bar where Buffalo chicken wings were invented. As New York's second largest city, Buffalo is known world-wide for its architectural treasures; only Chicago has a larger collection of buildings by America's foremost architects. In addition, renowned father of American landscape architecture Fredrick Law Olmsted who designed Central Park also designed Buffalo's park system where the acclaimed Albright-Knox Art Gallery is home to one of the top modern collections in the world. Summer and fall find large crowds enjoying Buffalo's waterfront events including bike tours, kayaking, free outdoor concerts, local food truck rodeos and more. A combination of a big city with small town warmth make Buffalo a relaxing place to spend some time and explore. Indeed, many travelers stay a few days but may stay several days longer than originally planned once they discover the city and its people. Whether you're coming in town for a concert, conference, a sporting even or just to explore this quiet cool city... we are here for you and open every night till 10:30pm. Desk hours 8-10:30AM & 4-10:30PM. If you are planning to arrive before 8am, we can suggest places near the hostel where you can enjoy a coffee or breakfast. There is no lockout or curfew for registered guests.